Packaging Aids Corp. 555 Vertical High Production Band Sealers seal most of the modern packaging materials such as PE, PP, PVC, Polycello, Laminated and Mil Spec. All models come standard with a digital temperature controller that gives accurate control to a maximum temperature of 550° F (288° C). The jaw pressure is adjustable to differing material widths. Seal widths are 7/16” standard or 1/8”, 5/16” and 13/16” are optional. The P.A.C. Band Sealers are made for working all day, and with an adjustable sealing speed of up to 400” per minute, a high rate of production can be achieved. Reliable and requiring little maintenance, the P.A.C. Bandsealer provides a strong, hermetic airtight seal, bag after bag with no rejects. Seal integrity is excellent and the machine is easily qualified for the most demanding applications. Versatile, it can seal the lightest as well as the heaviest of flexible heat sealable packaging materials. Models come standard with a durable painted steel finish. 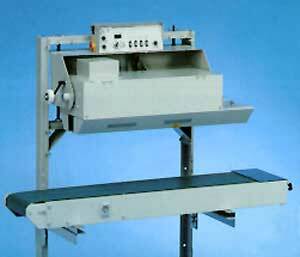 The Packaging Aids Corp. Model 555 Adjustable Head Band Sealer is a vertical model to accommodate all size bags, the head can be rotated 90 degrees and positioned anywhere between the horizontal and vertical. The sealing head can be raised or lowered between 26” and 39” from the floor. An optional motorized 54” conveyor can be integrated with the Model 555 to make production fast and easy. An adjustable cutter is a very popular option on the P.A.C. Bandsealer, the cutter can also come with a scrap remover. A Hot Stamp Printer is also available to imprint up to 2 lines of 12 characters each in the sealing area. An embossing device to encode in the sealing area is also available. shown with optional horizontal conveyor. FOB: San Rafael, California. Machines usually ship in 10 business days, parts in stock.